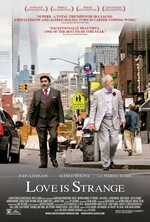 John Lithgow and Alfred Molina, settling into old age and comfortable in their decades-long partnership, are forced into couch surfing by economics and homophobia. The upheaval this causes them and their community is explored with gentle humor and compassion. I walked away from this feeling really good, glad I watched it, impressed with the low-key but on-key performances of Molina and Lithgow. I liked the rest of the cast too, and appreciated the quiet pace. There were some really funny moments about youth and aging and everyone's quirky personalities and little personal struggles. 1. Gay movie = someone must die. Ultimately I thought the death worked with the story. But you can't help but feel it was hastened by the stress of the situation, which was brought on by homophobia. Gay people must die is the ultimate trope of gay movies dating back to all time. I'm so over it. If this movie existed in a vacuum where no other gay movies had showed gay people dying, it would be no big deal, the whole thing is talking about aging and sort of what life means when you look at it from a place closer to the end. But in context I thought it was problematic. 2. The very end seems to pass some kind of torch to the grand-nephew. Was the story really about him? Did the lead characters simply serve as props in his emotional development, ultimately reinforcing heteronormativity? I don't know, I"m sure that's a stretch, but it bugged me. Anyhow, I was really glad I saw it and without a lot of analysis I just really enjoyed it. For some reason the tone reminded me of Lisa Cholodenko movies - something about the ensemble cast and intergenerational interactions. Maybe that's mostly the rarity of seeing older characters fully fleshed out. It seems obvious to me this was his "hopeful" script about a loving, healthy couple and the death was, well, part of life. Re: 2) no, the film was not about the nephew, but the future is and that's more hopeful stuff. It was not a hugely strong film, it's pretty easy to poke holes in it - yes, the main characters were fleshed out but just about everybody else was completely flat and barely a person. BUT Molina put on an acting clinic in this film; it was stunning to watch his reactions to Lithgow and I would recommend the film to anybody simply based on his performance.